Unilever was formed in 1930 by the merger of Dutch margarine producer, Margarine Unie and British soap maker, Lever Brothers. Today, the consumer goods giant sells food, home care, refreshments, and personal care products in over 190 countries. Unilever has headquarters in London, United Kingdom and Rotterdam, the Netherlands, and subsidiaries in over 90 countries. The company employs more than 170,000 people. In 2012, Unilever reported more than €51 billion in revenue. Unilever North America in Englewood Cliffs, New Jersey needed to re-design its infrastructure to support Unilever’s digital marketing approach. Unilever previously used on-premises data centers to host its web properties, all of which had different technologies and processes. “We needed to standardize our environment to support a faster time-to-market," says Sreenivas Yalamanchili, Digital Marketing Services (DMS) Global Technical Manager. Unilever optimizes its business model by testing a marketing campaign in a pilot country. If the campaign is successful, the company deploys it to other countries and regions. The IT organization wanted to use the cloud to implement the same process. The Unilever IT team had two goals for the AWS migration: deliver a common technology platform for websites with regional content delivery architecture, and migrate existing web properties to the cloud. To develop the platform, Unilever attended an AWS workshop to design the architecture. Then the DMS team built a pilot platform (a disaster recovery site for third-party hosting in Miami) for stakeholder review. After obtaining business approval, Unilever chose CSS Corporation, an Advanced Consulting Partner member of the Amazon Partner Network (APN), for system integration and application development. The DMS team worked with CSS to develop a global content management system (CMS) . The CMS platform lets agencies build brand web sites globally and publish them across several AWS regions. Unilever uses a HAProxy load balancer to improve performance of its web sites and runs its databases on Microsoft SQL Server and MySQL. For disaster recovery, Unilever stores backup data, snapshots, product and recipe media files in Amazon Simple Storage Service (Amazon S3), and uses EBS Snapshot Copy to copy Amazon Elastic Block Store (Amazon EBS) snapshots from the US East (Northern Virginia) Region to the US West (Northern California) Region. “We designed a disaster recovery solution to protect our content management system, content deployment architecture, and many GOLD-classified web properties—and to give the business confidence in the AWS Cloud,” says Yalamanchili. 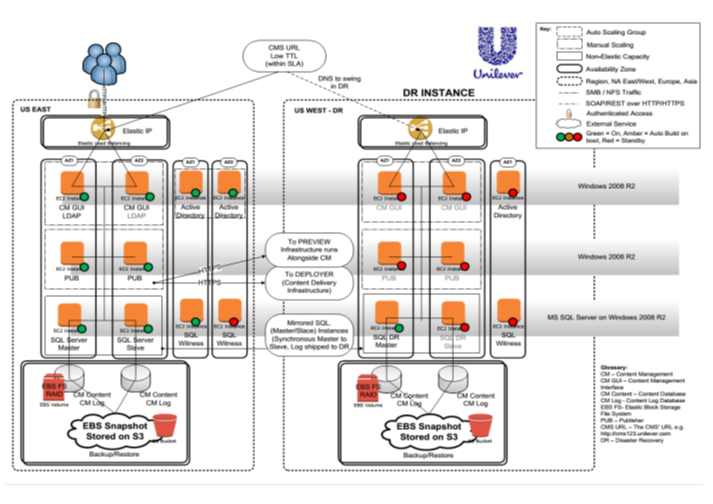 Figure 1 demonstrates Unilever’s architecture on AWS. To migrate its web properties to the cloud, Unilever built pre-production and production environments on AWS for several existing websites. Once Unilever’s creative and production agencies certified the website in the pre-production environment, Unilever switched the DNS address for production environment to go live on AWS. To learn more about how AWS can help you run websites, visit our Marketing Websites page: http://aws.amazon.com/websites/. For more information about how CSS Corporation can help your company run on the AWS Cloud, see CSS Corporation's listing in the AWS Partner Directory.